Would you like to be regularly featured on Jewrotica? We are currently accepting applications for next year’s Double Mitzvah columnist and are always looking for new writers. Contact editor@jewrotica.org for more information. 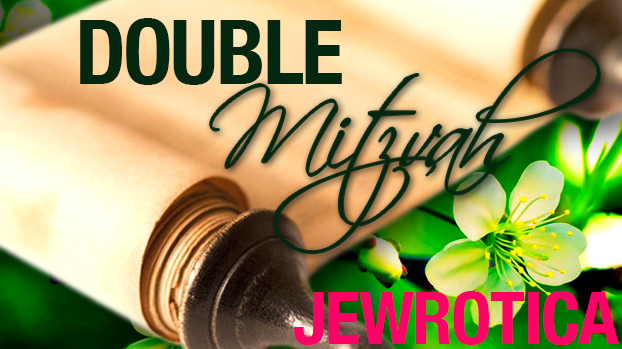 For a commentary on last week’s parsha, check out Double Mitzvah – Nitzavim Vayelekh. This week’s Torah portion, Haazinu, is a long poem that Moses recites to the Israelites recounting their covenant with God and the consequences of straying from God. At the end of the portion, God tells Moses that he will die on Mount Hor before entering the land of Israel. Moses is allowed to look out over the Promised Land, but not to enter it. This week’s Torah portion also comes immediately after we celebrate Rosh Hashanah, the new year, when we may choose to make new years resolutions, hoping to improve our behavior in the coming year. This Shabbat, when we read Haazinu, is called Shabbat Shuva, the Shabbat of return because it is hoped that on this Shabbat we will return to God, from wherever we have been. So this weekend is a good time to think about combining both of these messages. It is a good time to take stock of our relationships, and the places where we feel we may have failed. Is there something that we are doing that is keeping us from advancing into our own promised land, whether that is a state of mind, or a better, more solid relationship? And is there a way for us to bring the concept of returning, and returning to God, into our relationships? As we move into the New Year, we look back into our relationships from the past year, and forward towards the behavior we want to practice in our relationships in the coming year. Shanah tova and Shabbat shalom! ← Previous Story Shana Tova from Jewrotica! Well said. Shana tova, Tamar!